You’ve probably heard this story a million times already: student groups invite speakers who dare differ from the liberal orthodoxy to speak on campus, only to see them shouted at and abused. Yet, an interesting turn of events occurred earlier this month at Harvard University. Political scientist and sociologist Charles Murray was actually allowed to speak—largely without disruption. The scene was quite different from what occurred at Middlebury College last March. Similar to his lecture at Harvard, Dr. Murray traveled to the small liberal arts school in Vermont to speak about his 2012 book Coming Apart (not by any stretch of the imagination a controversial book). In the book, Murray demonstrates that a new upper class and a new lower class have diverged so far in core behaviors and values that they barely recognize their underlying American kinship. 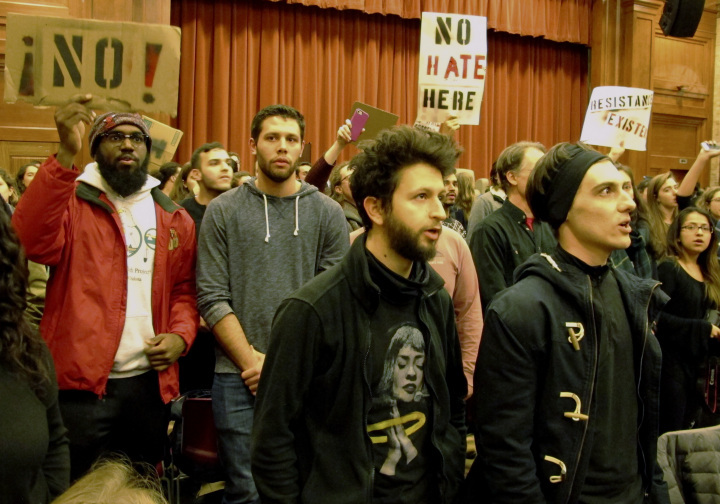 Through yelling and threats of violence, student protesters were able to “shut down” the event. Students even resorted to physical violence, as they surrounded Murray’s car and even injured a professor. So, why was Murray’s experience at Harvard so different from what occurred at Middlebury? Is it because Harvard is a bastion of free speech, while Middlebury would be considered an excellent school in the Soviet Union? Or is it because Harvard students are more open to the free exchange of ideas, while “Midd kids” shudder at the idea of a controversial conservative author speaking on campus? At least according to Murray, his lecture at Harvard largely went uninterrupted because administrators showed that they were in charge. Harvard has made it clear to students that anyone who disrupts a speaker will be warned, and repeat offenders will be escorted out of the lecture hall if necessary. Harvard administrators proved that they are committed to protecting the First Amendment and will not cow down to radical domestic terrorist groups such as Antifa. A little over a week after Murray spoke at Harvard, another interesting turn of events occurred at the university credited with starting the Free Speech Movement: Ben Shapiro, a conservative author, was allowed to speak at The University of California-Berkeley. However, this event was by no means easy to put on. Berkeley administrators added obstacle after obstacle, such as levying a massive security fee against the student group and seizing extra tickets to prevent students from attending, all in an effort to suppress conservative speech. Now it is just a matter of putting these words into action. Let’s hope the administration shows students who’s in charge and can serve as a model for universities that already seem to be too far gone. When all was said and done, the event totaled over $600,000 in costs, according to a tweet from Shapiro. How pathetic is that? It was not long ago when a similar event would cost less than $30,000. This school year, University of Michigan administrators and students will be faced with a question. Will the University act like Harvard and enforce it rules when conservative speakers come to campus? Or will it fall down the Middlebury and Berkeley abyss, only to see the First Amendment trampled on? The first test for the university will be Charles Murray. Dr. Murray will speak at Michigan this October for a lecture and Q&A on “Coming Apart: How Class Division Sparked a Populist Revolt.” Murray was invited by the American Enterprise Institute Executive Council at Michigan (a group for which I co-chair) and College Republicans. Murray will most likely be greeted by protesters, which will not be an issue as long as the administration enforces its policies. If students proceed to interrupt the speaker repeatedly, it is the duty of the university to make sure these students are escorted out. The university has already done a great job in the lead up to the event. Unlike Berkeley and the Shapiro event, there will be no massive security charge levied on the student groups in order to protect Murray. The administration has already said that the Division of Public Safety and Security (DPSS) will be empowered to remove protesters who aim to “shut down” the event. It is without question that there are students who want to hear conservative ideas on campus. The question is whether students will be allowed to listen. And who knows, maybe Shapiro will make his way to Ann Arbor sometime this year? Let’s just hope it doesn’t cost over half a million dollars to make it happen. Should We Stand for the National Anthem?